“Sitting atop crumbling ruins, ever waiting, for I am the guardian and the herald.” Kidrobot continues J*RYU’s curated Arcane Divination Dunny Series with this epic Azazel 5” Dunny vinyl figure by Jon-Paul Kaiser! Ever watchful, this winged creature is marked as the fallen angel thrown to eternal fire. The creature stands as a representation of the human spirit’s need for rebellion, temptation, and the seductive lure of the unknown. Fused with “carved marble” and “porcelain” brought together in pieces to make a whole, this broken figure is a small part of the bigger plan. 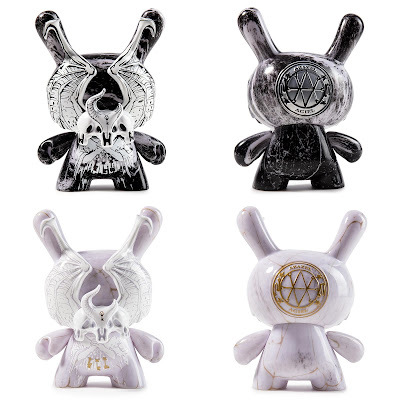 Encapsulating centuries of evil magic from the infernal hierarchy, the Arcane Divination Azazel 5” Dunny by UK artist Jon-Paul Kaiser stands as the warning of something new coming to the mortal realm. 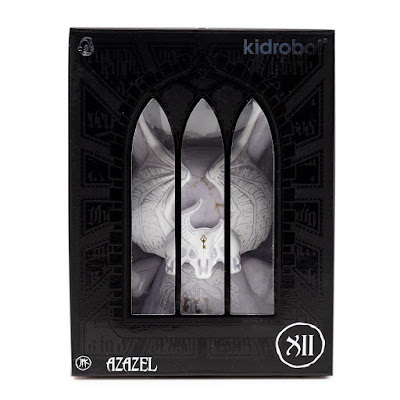 The Azazel Dunny vinyl figure by Jon-Paul Kaiser stands 5” tall and is available in two colorways, a Black Marble Edition and a Gold Marble Edition. The Kidrobot.com Exclusive Black Marble Azazel is limited to just 250 pieces, while the Gold Marble Edition is limited to 950 pieces. Both colorways are available for purchase at the Kidrobot online store for $49.99 each.